In January 2009, The Pleasurize Music Foundation launched an initiative for "ending the "Loudness War" being waged by successive music releases." This initiative aims to introduce a dynamic standard through several phases. It is currently available as a VST effect plug-in for Windows with Mac OS X, RTAS and AU versions expected to be released later this year. An online database is planned for providing information on music already released with the standard. In this way, according to the Foundation, conditions have been met for the creation of a single standard for audio recorded media – a step which was taken by the film industry over thirty years ago. Music with small dynamic range has a low value, for example DR4 (Dynamic Range = 4dB). 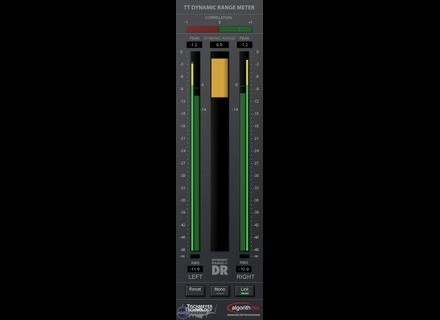 Music with a large dynamic range has a higher DR value, for example DR14 or more. Knufi SIR2 Reverb Updated Christian Knufinke Software has updated SIR2 Reverb to version 2.4 for Windows VST (incl. 64-bit version) and Mac OS X VST/AU. Nucleus Soundlab Viral Outbreak Update Nucleus SoundLab has updated Viral Outbreak VSTi to v1.5.